Occasionally a manga comes along that makes me squee with glee every time a new volume is released. Though I’ve only read the first two volumes, I can tell that Blue Exorcist is going to be one of those manga. Volume 1 introduces Rin Okumura, a well-meaning but short-tempered teen who has been raised by Father Fujimoto, a high-ranking exorcist, in place of the father he has never known. When a sharp argument between the two causes Father Fujimoto to drop his spiritual guard, Rin finds out why his father has been so absent: The lapse causes Father Fujimoto to be possessed by the demon lord Satan, who reveals that Rin is, in fact, a son of Satan (skip to the end of the review for more on that), and can possess all the demon powers that come with it when he unsheathes the magic sword that contains them. Generally, it’s not a good thing to be the son of the devil in the presence of exorcists, so Rin finds his life in mortal danger. Rather than run, though, he makes a rather unexpected decision. Feeling himself responsible for Father Fujimoto’s death, and determined to defeat Satan, he decides to become an exorcist. He is thus allowed to enter True Cross Academy, the training ground for exorcists, under the watch of eccentric Academy president Mephisto Pheles, who has plans of his own for Rin’s powers. In Volume 2, Rin meets his classmates and begins preparing for the Exwire Examination, the passing of which is his first step to becoming an exorcist. His successes are varied—He’s not an enthusiastic student, preferring field work to studying, and his snap-quick temper sometimes gets him into trouble with other equally hot-tempered students. However, he does form enough alliances to have help when powerful demons attack the school. Perhaps most importantly, though, he learns of the Blue Night, a night 16 years ago on which powerful exorcists around the world died after exploding into blue flame—the same blue flame that is the mark of Satan, and that identifies Rin as his son. 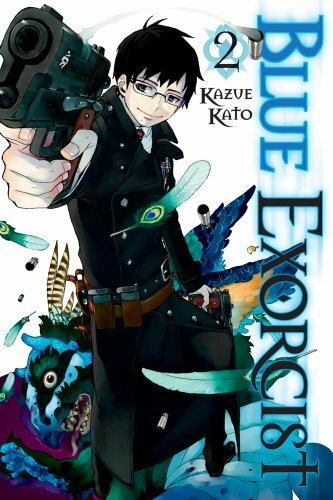 Blue Exorcist reads like a direct successor of D.Gray-Man and Soul Eater, two other familiar demon-hunting manga. It combines the quirky-cast-of-exorcists model found in the first with the bizarre artistic flair of the second, and then one-ups them both by featuring a surprisingly complex set of character relationships, and stellar art to boot. The basic story of the series is, unfortunately, very familiar: boy-looking-for-his-place-in-the-world-gains-magic-powers-and-goes-to-school-to-learn-to-use-them. But the abovementioned good points easily make up for this. While the individual character types (for the main characters, at least) are about as familiar as the story type, the ways in which they interact are interestingly plotted. In Volume 1, for example, Rin’s high-powered abilities and his twin brother Yukio’s weakness around bullies would lead readers to expect Rin to be Yukio’s constant protector. (Rin got all of Dad’s demon powers, leaving Yukio with nothing but brains and a cute, squishy face.) However, the story works in such a way that Yukio ends up being Rin’s defender and even his teacher at the Academy…while at the same time knowing that he’ll be responsible for destroying Rin if his demon powers get out of control. Most of the individually interesting character types are introduced in Volume 2, which sets up most of the supporting cast. These characters are also made of clever combinations of traits, my favorite being Ryuji Suguro, the class muscle who also happens to be a really intelligent student, and another favorite being Izumo Kamiki, an initially manipulative girl who, instead of spending a whole series figuring out that It’s Bad to Manipulate Friends!, learns it early, and then uses the damage caused by her actions as the driving force behind her future choices. For me, the only uninteresting character is Shiemi Moriyama, whose main goal at True Cross Academy seems to be to make friends and be adorably shy while doing it, but even she serves an eventual purpose in Volume 2, which is more than I can say of other manga characters who exist only to be The Cute One. And by the end of the second volume, Shiemi does become legitimately endearing. That said, this is one of the few manga in which I’ve found all of the characters appealing on some level. Equally as appealing as the characters is the art. Kazue Kato uses a smart balance of simple character-focused frames and immensely detailed setting-focused frames, throwing in the occasional detailed character shot, too, for extra spice. It’s a clever, practical way to produce art that is both dynamic to look at for the readers and turned in on time for the comic’s editor (always a concern for these deadline-driven series), and it works well here. And then there are the covers. 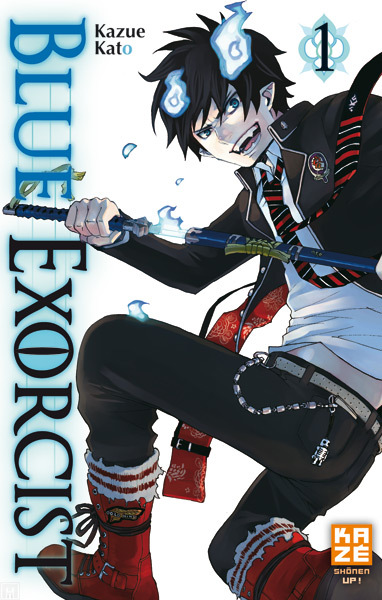 Blue Exorcist is a series that I considered buying for the covers alone, even before I read the actual books. Kato has a brilliant sense of color and character design, and when I tried to think of other manga covers to compare these to, I couldn’t. They are truly in a class all their own. The character designs themselves are worth some mention, too, not merely because they’re great, but because they’re also pleasantly varied. The absurd and clownish (and even iconic) design for Mephisto Pheles is one of the most memorable character designs that I’ve seen in recent manga. A series full of character designs like his, though, could have become overwhelming to look at, which is why I consider it a good choice on the part of the artist that most other characters in the series were rendered in fairly normal clothing—normal for a manga, anyway. The variety of face designs is commendable in this series, too. Many manga suffer from having too many characters that are simple variations on one basic character design, rendering them all basically indistinguishable. Everyone in Blue Exorcist is unique and recognizable. The series’ only real problem, if it can be called one, is this: Some readers may be uncomfortable with the fact that the series’ protagonist is the son of Satan. However, as most anime/manga fans will already know, this isn’t intended to be a religious statement. In anime and manga, priests regularly wield ridiculous guns (Trigun, and virtually every manga involving a priest), nuns blow up things with abandon (Chrono Crusade), bible verses have magical power (Le Chevalier D’Eon and also this series) and the Vatican possesses an airship force and employs vampire-eating-vampires (Trinity Blood). In short, Japan’s take on Christianity, in its comics, at least, is pretty much like America’s take on Greek and Roman Mythology: We entertain ourselves with the parts we like and then add explosions to the rest. For those who can jump this latter hurdle, Blue Exorcist comes highly recommended. If you like D. Gray-Man, Soul Eater, or shonen manga in general, this is a definite title to try. ‹ The Dragons of Jupiter: Cover Art Complete!